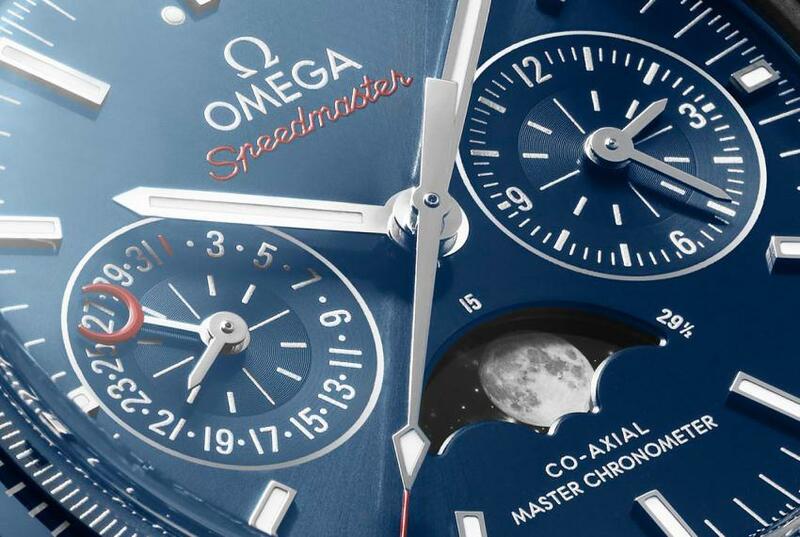 Omega’s Speedmaster holds an enviable position as one of the most universally loved watches in the collecting community. Even when it isn’t exactly loved, it is respected. Very few watches occupy the intersection of timeless design, heritage, and literally not-of-this-earth tool watch credentials. There may not be a more tested watch available to collectors. Omega knows all this. Omega also knows it’s a bad idea to mess with a successful formula. Which is why, with the exception of the Mark series variation, the Speedmaster of today doesn’t stray very far from the template laid down with the Professional. Yes, there have been many variations, but they are all recognizably Speedmasters. You’d also be forgiven if you had trouble keeping track of the many special and limited editions of the watch issued over the past half century. Because there have been so many milestones associated with the space program, there have been many Speedmasters issued in celebration. This is so much the pattern that parts of the watch collecting community greet the announcement of a new Speedmaster with a certain amount of skepticism. 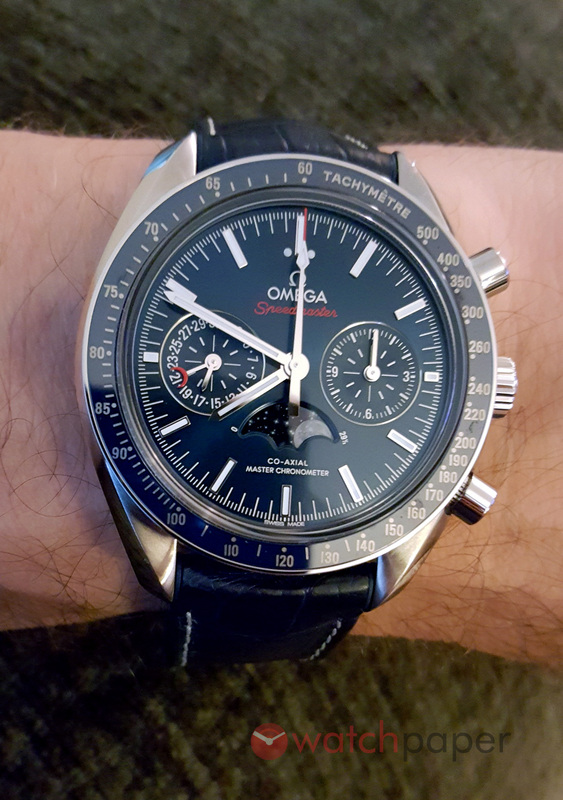 I normally encourage skepticism as a healthy part of a balanced psyche but, in the case of the Omega Moonphase Speedmaster I had the pleasure of wearing over the course of a week, that skepticism would be entirely misplaced. The framework is familiar because it is still very much the Speedmaster you are used to in its overall shape and design elements but this watch comes with an impressive set of technical innovations housed in an absolutely stunning package. 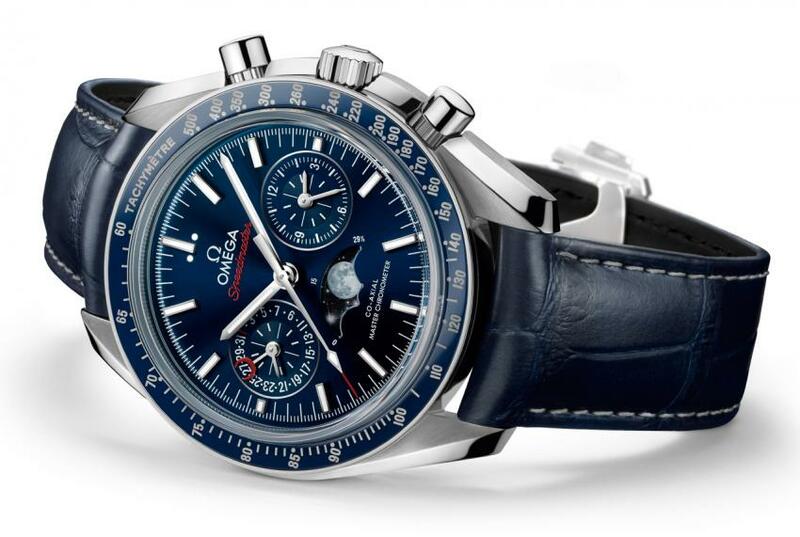 About that package…the dial alone is almost worth the price of admission: a three-register layout (as per the Speedmaster standard), with small seconds and date at 9 o’clock, totalizer at 3 o’clock, and the moon phase at 6 organizes the starburst brushing of the blue dial in a familiar configuration. 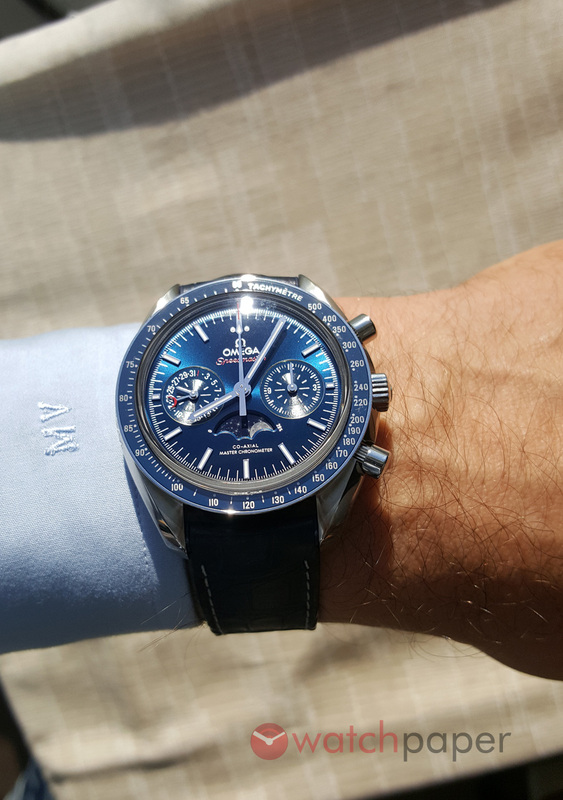 The applied hour markers and stick hands seem like deluxe versions of the standard-issue Speedmaster though that may be because of how they, in the right light, catch the blue light reflected from the dial face. Red accents also compliment the blue dial in the crescent date indicator on the 9 o’clock sub dial, the tip of the large chronograph seconds hand, and in the Speedmaster lettering beneath the Omega logo itself. Tasteful and restrained, the red accents break up the pool of blue dominating the colour palette of the watch. A little less successful, to my eye at least, was the liquid metal bezel. Introduced into the Omega lineup 7 years ago, liquid metal is a fusion of a zirconium-based alloy with ceramics at very high temperatures and offers clear advantages over stainless steel and aluminum in scratch resistance and hardness, but to my failing eyes the contrast between the blue bezel and the tachymetre’s numerals wasn’t high enough to promote stellar legibility. 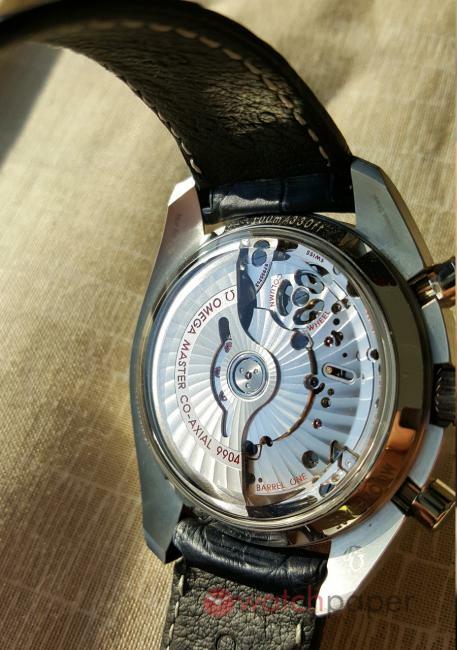 It could simply be a result of this watch’s particular colour scheme but, while the numerals were sharply-defined, they didn’t pop as they might with the black-dialled version of this watch. Worth a paragraph on its own is the moonphase. If you are a fan of this complication (and I am), the Speedmaster Moonphase is a dangerous watch to put on your list. The moonphase window is bracketed by a 0 and 29.5 to indicate more precisely the moon’s actual phase interval. 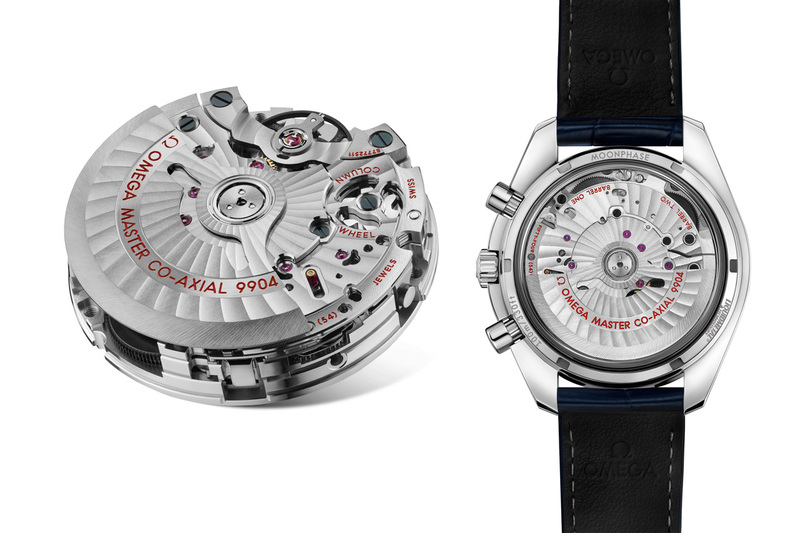 Omega claims the accuracy at one adjustment per ten years for the complication. But what’s most impressive is the high-resolution image of the moon and starscape that slowly glides through the register’s aperture. Photo-realistic in its detail, the moonphase is so captivating all by itself that focusing on it exclusively can make you forget it’s attached to a very impressive timepiece. I would glance at the watch for the time and realize, a few moments later, that I was marvelling at the moonphase register, wondering how Omega created such an accurate and beautiful rendering of our satellite. What’s more, there is an image of an astronaut’s footprint in the Sea of tranquility. I wish I could confirm this with absolute certainty but I don’t have the visual acuity to spot things this small with my own eye. I’ve seen images online at high magnification that do in fact show a footprint as part of the etched image Omega uses. I would think that I had spotted it, but then, like a mirage, the footprint wouldn’t be there when I pulled out my magnifying glass to have a closer look. 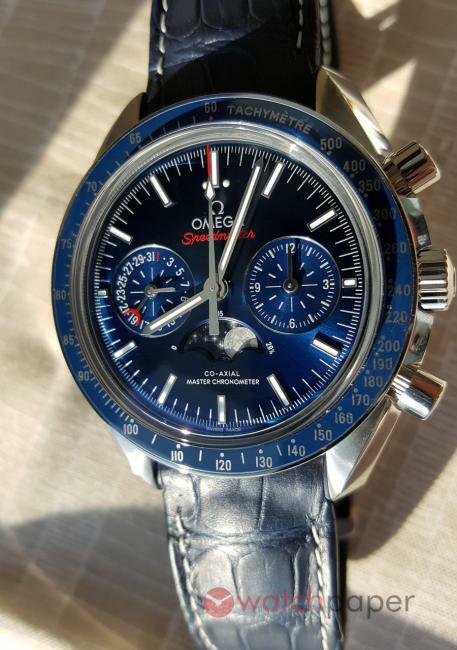 This is my failing more than Omega’s and the fact that I can devote so much review space to this one feature means that if you are at all interested in this complication, Omega’s execution of it with this Speedmaster may represent the end of your quest. It’s that impressive. The engineering this watch represents is as impressive as the aesthetic achievement this watch attains, though less showy. Powered by Omega’s calibre 9904 movement, the Speedmaster Moonphase Chronograph is both COSC and METAS certified. I wrote about what METAS means as a standard when it was introduced with the Globemaster, but suffice it to say that the certification picks up where the COSC leaves off and subjects the watch to a series of even more stringent tests. The specs on the Moonphase I wore are seriously impressive: a 60-hour power reserve, 15,000 gauss magnetic resistance, 10 atm water resistance and a co-axial escapement that delivers accuracy to within +/- 0-5 seconds per day under just about any conditions. My subjective experience with the watch saw one second over 5 days of wear, which is more than enough accuracy to satisfy even the most ardent mechanical watch fan. The only downside to this is the height of the movement. At 16.85mm, this isn’t going to fit easily under any dress shirt I know of. It’s become a standard trope of watch reviews to subject a watch to the “will it fit under a dress shirt” test but honestly, this is a watch that begs to be shown and seen and whether it fits under your dress shirt is, for me at least, rather beside the point when it comes to the Moonphase. Of course, it should be prominent on the wrist for all the world to see. The Speedmaster Moonphase Co-Axial Master Chronometer Chronograph (to give you the quintuple-barrelled proper name for the watch) manages to combine technical and aesthetic innovation within a familiar overall framework, and very successfully too. With the Speedmaster, Omega knows that it has to satisfy a tradition while also making it worthwhile for you to consider buying a new (and more expensive) variant on that tradition with a state-of-the-art movement and non-original but entirely appropriate complication. The Speedy Moonphase, with its breathtaking aesthetics (especially the blue variant) and modern technical features, manages to both honour the tradition it exists within while also offering something new, and of genuine value within that tradition. Available in October, with and MSRP of $12,700 CAD.